Bring YOUR ready to wear garments or YOUR fabric creations to life with the same crystals known from the red carpet for Broadway productions to major motion pictures: Swarovski crystals! The best known and most used crystals in couture fashion and jewelry design are now available in a wide selection offered only to independent dealers! These include Special Mixes of shapes, sizes and colors, all in an unmatched elegance that lasts for generations at the same level of quality and brightness, Swarovski crystals are beloved by quilters and fabric artists alike. Hotfix glue backing that melts with heat and adheres permanently to a wide range of fabrics and products for a washable, long-term connection! 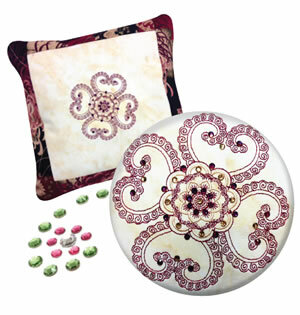 Add a touch of elegance and glamour to your embroidery and quilting with Swarovski crystals.